Hello, glad you came back to visit and hope you enjoy yourself and feel at home. 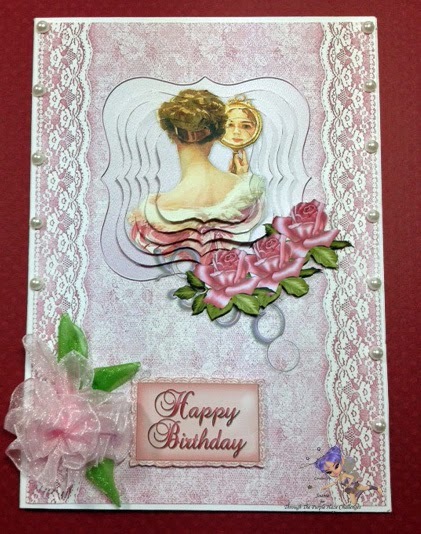 The card I have for today is a digital card.... no image to color, but a beautiful card when done. So here we goooo! I received the digital paper set from our most generous Sponsor, Crafts U Print and truly enjoyed working with it. I just cut the layers out and popped each one up with foam tape. I also popped up the Happy Birthday sentiment, but hard to see in the photo. I added some pearls along the lacy edges. I made my flower with some pale pink Gossamer Ribbon that I gathered to make the rose and buds and used a greed Gossamer Ribbon for a few leaves. (This is the 3rd flower I put on here.... just couldn't get the right feel if you know what I mean. So I was pleased with the softness of this one and I think it looks pretty. That's all that needs to be done as the Digital Card is so easy peasy to make. Crafts U Print has some very beautiful digital downloads to print for any occasion. You need to check out their store and see for yourself.... unbelievable! A one stop shopping store. Through The Purple Haze. Lots of fun, prizes, and we'd love to have you join us. Go to our blog and see the awesome creations the DT members have come up with!! That's all for now..... but will be back real soon. See Ya! absolutely lovely Joan... would never have thought to cut the image like that.....fantastic.